Start sautéing the onion in the butter for a few minutes. Add the squash, carrots, celery, potatoes and a pinch of salt and sauté for about another 10-15 minutes. At that point, add the cumin and ginger & othe spices. Sautee for a few more minutes before adding the water and the bullion cubes. Bring up to a simmer, cover and cook for about 20 minutes or until the vegetables are soft. 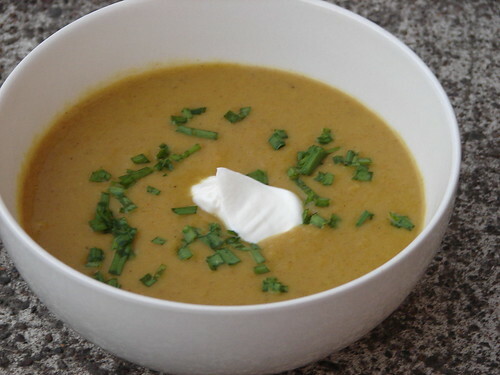 Once the carrots and the potatoes are soft blend the soup in batches in a blender. Add the balsamic vinegar and some salt and pepper. Taste, and possibly add more spices or other flavorings. Serve with chopped chives and a dollop of sour cream. For a heartier meal, top your soup with some sautéed sausage or bacon bits.